Imitation is the sincerest form of flattery. It’s also one of the most difficult, if what one seeks to imitate is the unparalleled and ultimately generation-defining sound of 80s pop. Synthpop outfit Ice Choir’s second album, Designs in Rhythm, is an observant and adept display of all the eccentricities and concepts of the decade. 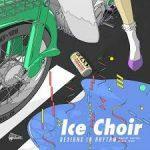 Ice Choir is the brainchild of Kurt Feldman, former drummer of indie group The Pains of Being Pure at Heart and founder of dream-pop project The Depreciation Guild. Yet, there is such dedication and intimacy in Ice Choir’s sound, it’s clear this is the kind of music that Feldman has been yearning to make. Their 2012 debut, Afar, was a brave departure from Feldman’s earlier projects and sped full throttle through a tunnel of artificial nostalgia. Armed with the prowess of his predecessors, Feldman crafted a painstaking tribute to the likes of Spandau Ballet, Orchestral Manoeuvres in the Dark and other new wave contemporaries. It was an accomplished debut, but didn't push the boundaries of the group’s potential. Thankfully, Designs in Rhythm harbours a newfound confidence in the band’s ability to harness that wistful, unparalleled 80s sound. A charismatic introduction – later complemented by an equally gaudy interlude – sets the tone for lead track, Unprepared. It’s a glossy, elegant slice of synth that scores high on pop drama. Title track Designs in Rhythm has Feldman taking vocal cues from Curt Smith of Tears for Fears, and it’s an impeccable imitation. Add some heavy synths and Talk Talk-style guitars, and it blossoms into a sprawling, emotive track. Windsurf has all the dance-pop sensibilities of Diana Ross’s Chain Reaction, while Variant slinks along to a velvet fretless bass and busy synth. The first half is a rich demonstration of the band’s careful ear for what makes those 80s hits so timeless. The second half of the album is a distinctly calmer affair. Amorous in Your Absence is one of the weaker tracks, laden with lovelorn lyrics and a meandering melody that at times feels contrived. Comfortable races along to a synth-backed harmonica break and vocal echoes reminiscent of early Prefab Sprout, but lacks the magic of the first half. The difficulty with Ice Choir is that their entire sound is built upon that of others’. This criticism may seem redundant, or even unfair, when pitted against the recyclable nature of the music industry as a whole. However, when the replica of the sounds that came before is this good, finding a band’s signature appeal is harder than it looks. In retrospect, perhaps that mimicry is their charm. It’s imitation, but it’s imitation with heart. The band is rewarded for their spirit. Including an introduction and interlude tells us that Ice Choir aimed for a fuller product: something more akin to an experience than a mere collection of songs. Designs in Rhythm is a pastiche of the musical zeitgeist of the 1980s, but it shines with genuine awareness and awe. An album the synthpop scene is certainly all the better for.